The ABA Journal has named this little corner of cyberspace, for the fifth time, to its annual collection of the 100 “best” law blogs in the country. Yes, of course “best” is in quotes, given that the apples to oranges comparisons are so highly subjective. And then the ABA went one step further and inducted me into its brand new Hall of Fame, along with nine others. While I’m flattered to be thought of, I’m also a bit embarrassed. Eric Turkewitz’s blog remains a great source for news and commentary from a plaintiffs-side tort lawyer. He may not be blogging as often as in years past, but when he does, it’s worth reading. Despite the name, it’s not all personal injury law; he talks about topics as diverse as politics, long-distance running, legal outsourcing and online extortion. Thanks to the ABA, that bounty goes unclaimed. In October, I gave some of the reasons for slowing down, and noted other things in life that take precedence. I can only write when I feel the emotion to write. I can’t, and won’t, be forced to do it, and I won’t do it when other things in life press in on me. Crap is produced when people feel like they have to write something just for the sake of it. At the moment I’ve only skimmed this year’s subjective list, as work presses on. But the inevitable problem exists of trying to compare one blog to another to create such lists, because you can’t, for example, compare Howard Bashman‘s How Appealing aggregation of appellate decisions with the constitutional analysis of SCOTUSblog. That is just silly. Both are meritorious, but they really can’t be compared in beauty pageant type voting (which the ABA encourages). Do you have legal problems? Reading this blog will not help. In fact, it will probably make them worse, and it will definitely make you feel worse. You don’t want that. If you think you may need legal representation, find yourself a good lawyer–preferably one who is recommended by other lawyers. If you want to vote in the beauty pageant — I’m in the Torts category — you can do so at this link. I’ve never “won” before and I don’t expect to this time. In the past I’ve trotted out Paris Hilton to campaign for me, and it didn’t seem to help. After three tries, I’m done with Paris. As you can tell, I take this very seriously, and you can read the reason why if you want. Now on to the Hall of Fame, leading with bit of history. In the first year of the ABA Blawg 100 listing, there wasn’t a single personal injury lawyer on the list. I wasn’t mad that I didn’t make it; I was ticked off that no one did. And I said so while listing many worthwhile candidates. 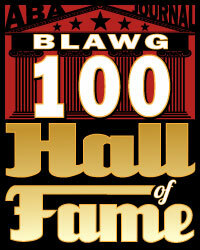 The Hall of Fame lists 10 blogs, and I assume more will follow in the ensuing years. The list is, of course, very subjective. The giants of the legal blogosphere are there in the form of Above the Law, Volokh Conspiracy, and SCOTUSblog. Also there are: Simple Justice, How Appealing, Robert Ambrogi’s LawSites, Patently-O, My Shingle, Legal Profession Blog, For reasons I still haven’t figured out, they tucked me in there also. Maybe seeing my face on the side of a bus did it. Frankly, with a list like that, I’m particularly glad that there’s no voting. Even in a beauty contest, I would hate to come in last.